Years ago at a party in Denver somebody asked me what I did. I said I was a translator. “That’s like straight out of a circus,” is what the response was. I wonder what that person would say today. At the Conference of the American Translators Association in Denver there were many signs that translators as well as interpreters play a more central role in American business and government. In fact, the professions made it onto the shortlist of the 50 best careers of 2011, as compiled by US News and World Report (updated Feb 2018). Terminology management is a niche, and many of my translator colleagues have asked me over the years what terminology is. The scientific answer is “terminology is the study of terms and concepts within a subject field.” Each domain or subject area uses specialized terms (as opposed to words) that have very specific meaning to the people using them. In terminology management, we coin, collect, research, document and distribute these terms, most often via terminology management system (TMS). Each term is documented in a terminological record that is not just used once and then discarded. Instead, it is set up so that it can be used over and over again similar to a paper dictionary. But because it is in electronic format, it can be connected to the authoring environment of a technical writer or the translation tool of a translator. And again similar to a paper dictionary, a terminological entry should follow standards. These standards and formats are different from a dictionary entry. In addition, the entry also is not a single, stand-alone record; it is connected to the related terms of the subject field which together form a system. Terminologists extract terms from documents, either manually or with the help of term extraction tools. They evaluate which terms should go into the terminology database. They do more or less extensive research and document their findings in the database. When the collection, e.g. for a particular project is done, they make sure that users know and have access to the data. And lest I get heat from my expert readers: terminology management can happen in monolingual environments. It is most often used in settings where source-language texts are translated into multiple target languages. But even then, terminology tasks happened long before the first translators touch a text. Going back to the circus reference from way back when: translation has become more mainstream in the US since. Terminology management has a long way to go. And I have likened terminologists to jugglers before. 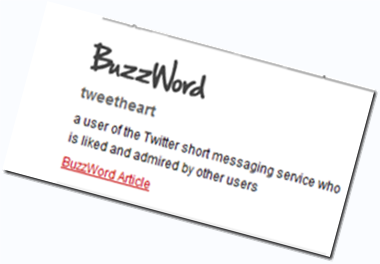 What do you call a user of the Twitter short messaging service who is liked and admired by other users? A tweetheart! And how do you use the term? Here is an example of how Belgian tennis player, Kim Clijsters, used it in a tweet from the Yahoo-Eurosport site: “Happy Australia day to all my Aussie tweethearts!” It earned her the Tweet of the Day. I am not a Twitter user, or tweeter, but the terminology of Twitter has been the subject of many conversations. While this social media has been emerging at an incredible pace, some of the terminology around it is quite well developed. The glossary provided by the Twitter service contains the basics. But it doesn’t list all the good (and bad) terms that have sprung up around the service. Some of the terms that don’t work so well are impossible to pronounce. The list in this article on About.com contains designations, like Twitpocalypse, which is defined as “the moment when the identification number of individual tweets surpassed the capacity of the most common data type. The Twitpocalypse crashed a number of Twitter clients.” The motivation behind the name is clear, though. This article* in the quarterly webzine of the Macmillan English Dictionaries, MED Magazine, has a very nice list of twitterisms. I would consider most of them quite well-motivated. If you don’t want to check out the link, here is another example: What group do people belong to whose tweets attract a large number of readers? The twitterati. *BIK: Unfortunately this article was removed recently. The concept denoted by the term “brand” includes many different aspects of a product. Considering that it evolved from the common practice of burning a mark into cattle for identification, it certainly contains the aspect of marks or symbols. Clairol’s Mist Stick curling iron launched in Germany: Mist is the German word for manure. The Silver Mist car by Rolls Royce was not a good choice for the German language market for the same reason. 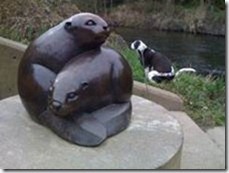 Rover connotes a dog; apparently, Land Rover had a problem selling cars; I am not sure that is still true. That connotation would obviously not bug me very much. These are funny, if you are not the branding manager of the respective product. At Microsoft, product names, but also many feature names went through a process called a globalization review. A target language terminologist, who is a native speaker of the target-market language, reviews the suggested name for undesirable connotations in the target culture. If the English name of a new feature is not to be retained in the target-language software, a so-called localizability review is performed. During this evaluation, the terminologist checks whether the connotations that the appellation has in English can be retained easily in the target language. They often try to find a designation that is very close to the original. If that is not possible, they will let the requesting product group know. Sounds simple, but this terminology task is something that is forgotten very often. Product developers might have very little exposure to other cultures and/or languages and don’t think to include terminology or linguistic tasks or checks in their development process. When translators, localizers and terminologists point out a faux-pas, it often is either not taken seriously or it comes too late. 1. Haig, M., brand Failures: The Truth About the 100 Biggest Branding Mistakes of All Times. 2003, London: Kogan Page Limited. 309.